One size fits all when it comes to holidays in the land of the free and the home of the brave. You want a pants-stretching food tour? Some rock’n’roll revelry? A road-trip steeped in history? Not a problem – would you like that supersized? With so much to explore, it's hard to know where to begin. Thankfully a good USA travel guide such as this one right here can help shape your dream American Adventure. The United States clearly doesn’t do things by halves! If you’re up for a super-sized adventure, the USA has already laid out the welcome mat. West coast surfers, east coast stockbrokers and real-life cowboys all call this great land home. The sights are iconic (the Statue of Liberty, the Grand Canyon, the Golden Gate Bridge), the cities vast and varied (Chicago, Miami, Houston) and the scenery spectacular (The Great Lakes, Chihuahuan Desert, Kenai Fjords). Whether you’re thinking of highway cruising, glacier hiking or canyon rafting, Flight Centre has your means of getting around the USA sorted. Most visitors prefer their flights to the USA to land in one of the country's major cities, whether you're pointing east, west or smack-bang in America's heartland. While the coast stretches all the way from Seattle to San Diego, there’s one state that dominates the West of the United States – California. You’ll definitely want to visit the cradle of innovation, San Francisco, where good times are a given. From pastel painted rows of abodes to blazing red bridges, San Fran is a visual delight. And hey, if you do leave your heart there, you’ll just have to make a return journey! Sprawling, scintillating Los Angeles – the City of Angels – is anything but a wallflower. Beach communities such as Santa Monica defy winter’s grasp, perpetually bikini-clad and rollerblading from one summer to the next. Home of the rich, famous and aspiring, Beverly Hills has a slew of star-studded mansions and equally famous shopping streets – Rodeo Drive for brunch, anyone? Rubbing up against Canada in the north trailing all the way down to Spring-break central Florida, the East coast is a diverse region that beckons discovery. If you don’t get stuck in the sweet Maple Country of New Hampshire, there’s a pretty well-known city you’ll want to work into your itinerary by any means necessary. New York City has it all: arresting architecture, world-class galleries and museums, classic cuisine, the next foodie fad, department stores you can lose yourself in for hours on end, the list goes on. Once you take a bite of the Big Apple, you’re going to want to whittle it away right down to the very core. The East Coast continues on to include the capital charms of the big city itself – Washington DC. Further still down the line, we come to one of the States’ best known holiday hotspots: the fabulous state of Florida. Whether it’s the theme parks of Orlando, the glorious offshore bliss of the Florida Keys or the sultry Cuban sway of Miami, the Sunshine State is well rehearsed in keeping its guests entertained. The mighty Midwest is too often known as ‘flyover country’, but those who do make the effort are rewarded with the big city attractions of Chicago and the musical stylings of Cleveland, St Louis and Kansas City. ‘The South’ is a big draw for many foreigners, where the pace of life is as slow as the local drawl. Big-hitting Texas isn’t shy of impressive hubs like Dallas, Houston and Austin, while neighbouring Louisiana is home to the cultural epicentre that is New Orleans. French-infused with sounds of jazz ringing through its streets, New Orleans is forever in party mode. 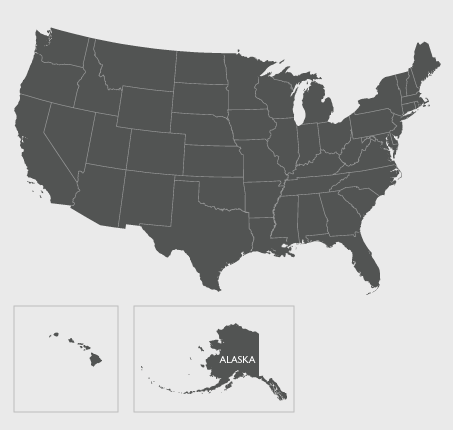 Of course there's Alaska and Hawaii too – out of sight, but certainly not out of mind. You couldn't find two more contrasting destinations if you tried, from the surf-washed shores of the Isles of Aloha to the frosty fields of the Final Frontier.